The data grid interactively supports manipulating data using the SfDataPager control. It also provides built-in options to page data on demand when dealing with large volumes of data. The data grid places the SfDataPager above or below to easily manage the data paging. To use the paging functionality in the data grid, add the Syncfusion.SfDataGrid.DataPager namespace to your project. Create a new SfDataPager instance and bind the data collection to the SfDataPager.Source property, based on which SfDataPager.PagedSource is created internally. Bind the PagedSource property to the ItemsSource of the data grid. 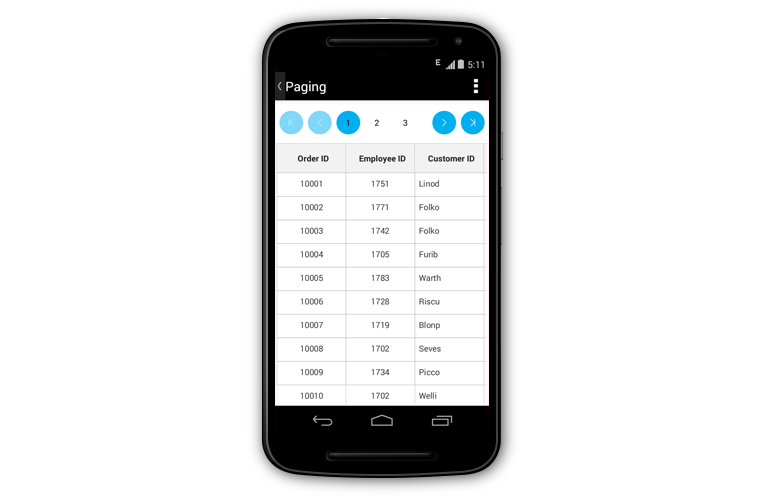 Set the number of rows to be displayed in a page by setting the SfDataPager.PageSize property. 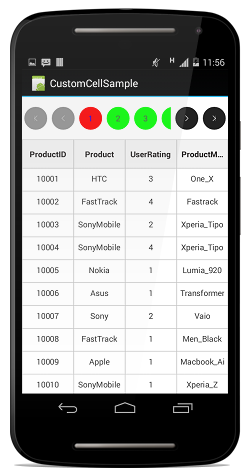 Set the number of buttons that need to be displayed in view by setting the SfDataPager.NumericButtonCount property. The SfDataPager.PageSize property should not be assigned with the value of 0. The SfDataPager provides scrolling animation when the FirstPageButton or LastPageButton are tapped. In normal Paging, data collection is entirely loaded to the SfDataPager. However, the data grid also loads the data for the current page dynamically by setting the SfDataPager.UseOnDemandPaging to true. To load the current page item dynamically, hook the OnDemandLoading event. In the OnDemandLoading event, use theLoadDynamicItems method to load the data for the corresponding page in SfDataPager. StartIndex: Defines the corresponding page start index. PageSize: Defines the number of items to be loaded in a page. In OnDemandPaging, you cannot assign a value for the Source property in the data pager. When using OnDemandPaging, the SfDataPager.PagedSource loads only the current page data. Upon navigation to another page, the OnDemandLoading event is fired which loads another set of data but also maintains the previous page data. When navigating to previous page again, the OnDemandLoading event is not fired and the required data is loaded which was maintained in cache. However, for further performance enhancement, if you do not want to maintain the previous page data, you can call Syncfusion.Data.PagedCollectionView.ResetCache() in the OnDemandLoading event. ResetCache method call resets the cache except the current page.